A useful and simple detector probe can be built with a few low cost components and a discarded ball point plastic pen case. The diodes can be Germanium (OA47, OA90 etc) or Schottly (HP2800, HP2835, BA482, 1N5711 etc). For best results the detector section should be screened. Any meter should be 50 or 100 microamps FSD unless some form of DC amplifier is to be used in which case it can be 1mA FSD. A 741 op-amp with its gain set to low (1-10) would be fine with a centre tapped DC supply or a second 741 can be used to provide a virtual centre tap for the meter return. 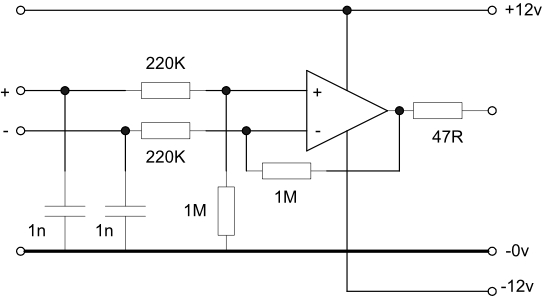 If a DC amplifier is to be used then a DC return must be provided for the probe - about 470K. to 1Meg. As shown the DC output will be positive with respect to ground. The detector components can be wired together using a small piece of printed circuit board or Vero board for mechanical support or just mounted on the metal ground screen before insertion into the insulated handle. 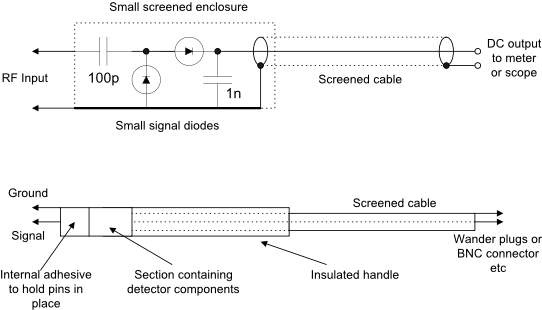 About 1m of any small screened or coaxial cable will be suitable to connect to the detector. When the probe is complete and tested a small self tapping screw or small amount of adhesive should be used to retain the electronics in the insulated handle. This probe is a little more complex than the previous ones and requires an operational amplifier to drive the meter. However, better temperature compensation and sensitivity can be obtained over a wide frequency range provided that VHF construction techniques are used - short lead lengths, good groundplane etc. The low frequency response will be determined by the 1n capacitor between the input and the first diode. To use at a lower frequency, increase the capacitor value. The detector diodes should be VHF Schottky types such as HP2800, BA482 or similar. The 500K potentiometer is used to set the meter zero and should be accessible in use. A general purpose op-amp like the CA3140 will be satisfactory and can be run from a supply as low as +/-5v although the 10Meg and 500K resistors will need to be reduced to about one third of their values shown below. To provide a 50ohm terminating impedance a 50ohm load may be constructed from two 100ohm surface mount resistors in parallel or a single 51ohm resistor as preferred. This may be preceded by an attenuator for measuring higher level signals. The diodes may be small signal germanium or silicon although Schottly diodes are preferred. Assemble the components on a small piece of printed circuit board. Use wire probes or a BNC coax socket at the RF input with very short leads to the PCB. The entire assembly can be housed in a small die cast box or a light-weight hand held probe assembly depending on your preferences. The op-amp and meter may be housed with the detector or in a separate box to reduce the weight. The maximum RF input will be determined by the breakdown voltage of the detector diodes. The completed assembly should be able to detect signals down to a few millivolts if the op-amp gain is high enough although the meter calibration will not be linear. If low frequency operation is required then the 1n capacitor may need to be increased in value. If this probe is to be used as a milliwatt meter then a small input attenuator will be required to provide a consistant 50ohms impedance at different signal levels. The following DC amplifier has been built and tested with the dual diode detector and the results are shown in the table below. Although the resistor values are not critical and can be adjusted to obtain different gains and sensitivities the circuit must be kept balanced. The op-amp is a CMOS CA3140. A useful and simple detector probe can be built with a few low cost components and a discarded ball point plastic pen case. The diodes can be Germanium (OA47, OA90 etc) or Schottly (HP2800, HP2835, BA482, 1N5711 etc). The indicator can be a high impedance analogue or digital voltmeter or an oscilloscope set to DC. A conventional moving coil meter is not appropriate because of the high value series resistor. The three components may be housed in a simple screened enclosure with small attached ‘prods’. The DC output will be positive with respect to ground. As you can see from the table the output is not linear, especially at low levels. This means that to make a calibrated instrument, a number of scales will be required on the output meter. With short leads, the frequency response will be flat well into the VHF bands. As can be seen there is pronounced non-linearity at the lower end of the characteristic due to the diode conduction threshold of approximately 400mV. This can be improved but not completely eradicated by applying forward bias as shown lower on this page. 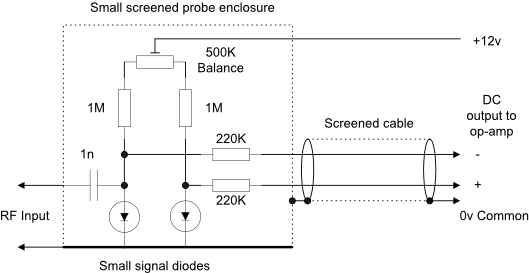 A detector probe has has been built using this circuit with an HP 5082-2800 Schottky diode and the same mechanical structure as shown in item 4 of the scope probe page in the Test Equipment Menu but with conventional screened cable - see here. A switch has been added to change the series resistor from 1Meg to 10Meg to provide a reduced load on the circuit being measured. This was developed specifically for carrying out relative voltage measurements on very high impedance tuned amplifier stages where the stage gain can be determined using a signal generator’s calibrated attenuator. The loading effects of the probe shown below were measured on a single tuned circuit in a Marconi TF1245A Q Meter. As can be seen from the results, the probe has a very small effect on the tuned circuit Q at 7.2MHz but somewhat more at 45MHz. An alternative would be an active probe using a solid state or valve device - the latter being more rugged but requiring more circuitry and power supplies.